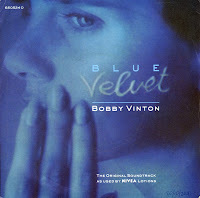 'Blue velvet' was first a hit for Tony Bennett in 1951. 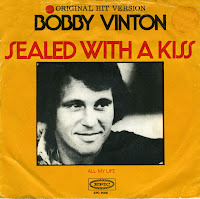 Bobby Vinton recorded his version twelve years later, and made number 1 in America. In the UK, the song did not chart until it was used in a commercial by Nivea lotions. On that occasion, it made number 2. In 1986, the song was used prominently on David Lynch's movie 'Blue velvet', which is where I heard this song when the film was televised somewhere in the late Nineties. I didn't like the movie, but I did like the song. And so I bought it when I found the 1990 UK release. When Jason Donovan hit the charts in 1989 with 'Sealed with a kiss', I immediately recognised a beautiful song - but with a terrible singer. I was relieved when I found out that it was actually a cover version and older versions existed. One of those versions was pointed out to me by my sister: Bobby Vinton recorded the track in 1972 and reached number 3 in the Dutch Top 40 with it. It's my favourite version, although earlier versions also exits: Four Voices recorded it in 1960, Brian Hyland in 1962 and Gary Lewis and the Playboys in 1968.